I visited the site and realised that it is actually very useful, epsecially when you are looking at some kitchen products, and have no idea which is better, more functional, its comparable pricing in the market, and how to purchase it. 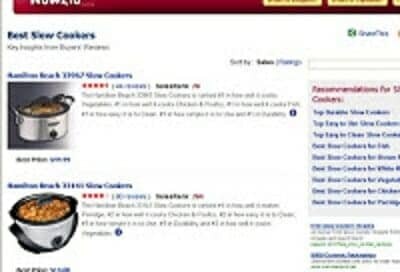 Many comparisons of items, for instances, slow cookers, were actually from reviews write-up by real-life users. Insights is a 3-tier system that bubbles up top-notch products for a given task or function, eg. ‘Best Blenders for making Smoothies’. The base tier consists of an Insights-Extraction system, which as its name suggests, extracts key insights from reviews of users who have used these products. This gives us products that are good for a given task or function. The middle tier is a normalization and ranking tier called TopRank. This is used to rank products obtained from the base tier. The normalization layer factors in product level parameters like how buyers have rated a product, the number of times buyers have rated a product, how well a product has sold, as well as how a product’s price is trending. The top tier (currently in development) is user-voting and editorial oversight. Excellent blog, nice post. I love to vote for this beautiful blog. I VOTED and recommend your blog to many of my friends to Vote. Pls support me with your precious Vote. Here is my Voting link.